Latin offered four days per week, grades 6-8; twice per week, grades 3-5; one day per week, grades 1-2. 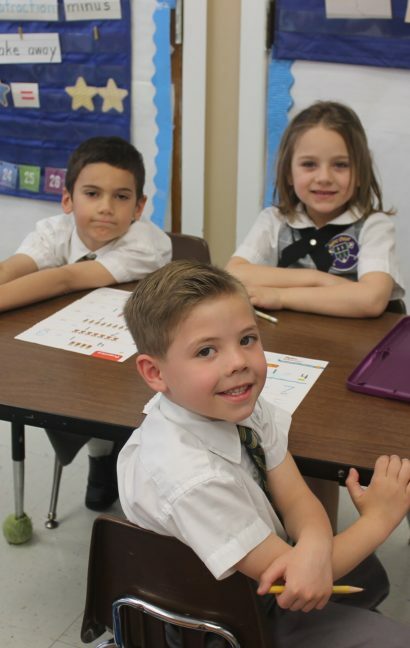 St. Peter School seeks to provide an organized curriculum within the guidelines of the Diocese of Camden that is coherent, sequential, and substantive. We seek to operate within the Catholic intellectual tradition, while remaining open to legitimate innovations in education. This means that we focus on the accumulation and expansion of the child’s knowledge base through content mastery, while developing foundational reading, writing, and math skills. Yet beyond these baseline skills, we seek to cultivate critical 21st century skills such as innovation, creativity, and problem solving. For this latter reason we seek an integrated curriculum that preserves the liberal arts tradition of Catholic schools, yet interfaces with innovations in science and technology. In the context of our Catholic tradition, we feel that the best way to achieve these ends is to preserve a virtue-based curriculum. This means that the goal of our educational project at SPS is the development of the child’s full spiritual faculties: the memory, the intellect, and the will- including the traditionally recognized powers of the soul, such as the imagination, conscience, and the emotions . The traditional theological virtues (faith, hope, and charity), along with the four cardinal or human virtues (prudence, justice, fortitude, and temperance) contain the underlying dispositions necessary to develop the aforementioned skills. Further, in an academic context, we seek to cultivate the five primary intellectual virtues: wisdom, knowledge, understanding, art (broadly understood), and prudence. When crafting lessons, teachers are asked to reflect on these virtues and develop lessons that cultivate them within the context of learning. Teachers are given opportunities to reflect on the powers of the soul and to align their lessons with the cultivation of these powers by means of the virtues. The Church is bound as a mother to give to these children of hers an education by which their whole life can be imbued with the spirit of Christ and at the same time do all she can to promote for all peoples the complete perfection of the human person, the good of earthly society and the building of a world that is more human (Gravissum Educationis, par.3).